Want more daring architecture in the District? You may just get your wish, thanks to the Smithsonian Institution. 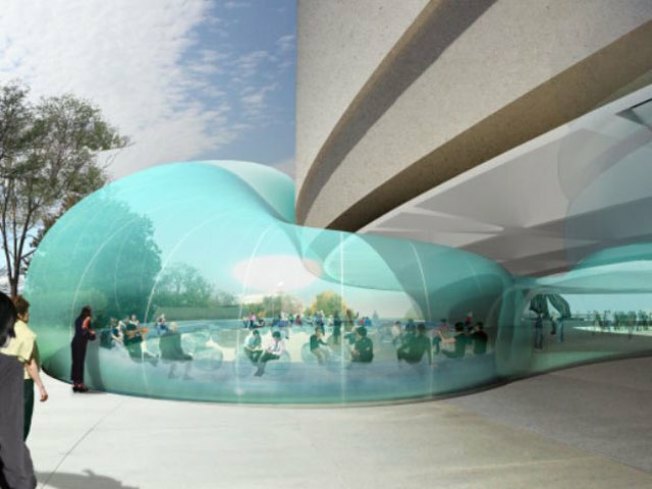 Plans for an inflatable pavilion bubbling out of the Smithsonian's Hirshhorn Museum are moving closer to reality on the National Mall at Eighth Street. balloon-like addition in the museum's courtyard would create an unexpected attraction. The Smithsonian presented two design alternatives -- both call for an asymmetrical egg-shaped dome to cover the museum’s existing open-air center courtyard and an enclosed café space situated west of the museum building. The first alternative, called a “Soufflé”, is the Smithsonian's favorite. It would be 14,000 square feet and fully enclose the museum’s courtyard with occupiable space. The second design, called the “Cork”, would extend above the courtyard but would leave the sides open. The NCPC acknowledged the Smithsonian's favorite, but said further study of both would be best. The designs would turn the courtyard plaza into a public venue for art, films, lectures and debates for the months of May and October. When not in use, it would be stored off-site for the rest of the year. It has an expected life-span of 25 years, and then could be recycled. Harriet Tregoning, who represents Washington Mayor Adrian Fenty on the commission, said the members want to see more daring architecture in the city. In February, the U.S. Commission of Fine Arts also approved the temporary structure. Museum director Richard Koshalek has said he wants to create a special performance and educational space to discuss cultural issues.